Two years after directing the Academy Award-winning documentary, “Inside Job,” filmmaker Charles Ferguson returns with a new book, “Predator Nation: Corporate Criminals, Political Corruption, and the Hijacking of America.” Ferguson explores why no top financial executives have been jailed for their role in the nation’s worst economic crisis since the Great Depression. We also discuss Larry Summers and the revolving door between academia and Wall Street, as well as the key role Democrats have played in deregulating the financial industry. According to Ferguson, a "predatory elite" has "taken over significant portions of economic policy and of the political system, and also, unfortunately, major portions of the economics discipline." Charles Ferguson, the Academy Award-winning director of Inside Job, a documentary about the financial crisis. His film on the war in Iraq, No End in Sight, was nominated for an Academy Award. 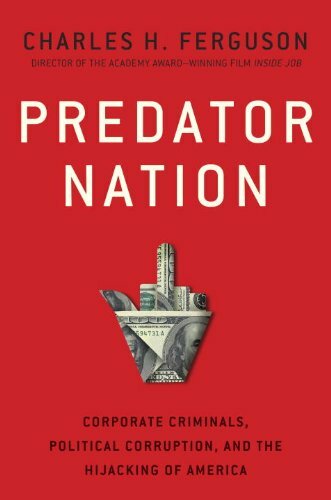 His new book is called Predator Nation: Corporate Criminals, Political Corruption, and the Hijacking of America. We continue our conversation with Charles Ferguson, director of the Oscar award-winning documentary, “Inside Job,” about the 2008 financial crisis. In his new book, “Predator Nation,” he argues “the role of Democrats has been at least as great as the role of Republicans” in causing the crisis. Ferguson notes the Clinton administration oversaw the most important financial deregulation, and since then, “we’ve seen in the Obama administration very little reform and no criminal prosecutions, and the appointment of a very large number of Wall Street executives to senior positions in the government, including some people who were directly responsible for causing significant portions of the crisis.” Ferguson also calls for raising the salaries of senior regulators and imposing stricter rules for how soon they can lobby for the private sector after leaving the public sector.